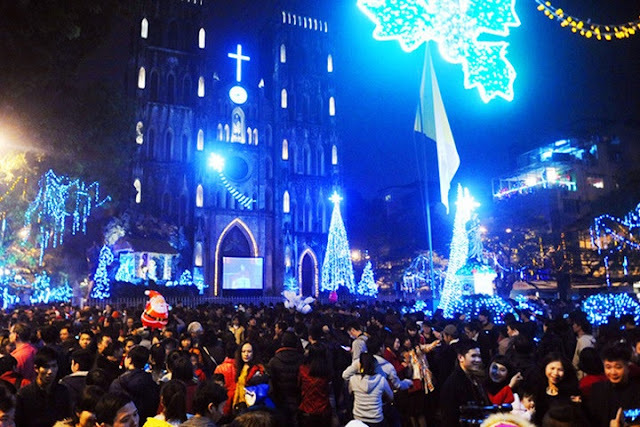 Hanoi\'s famed cathedrals were among the most highly decorated and most visited sites around the city on Christmas Eve. The church is located in the city center. It is built on the foundation of Bao Thien - the famous ancient tower of Thang Long in the Ly Dynasty (11th-12th centuries). It is also called the Church of St. Giuse (Saint Joseph), because the Pope Innocentinus XI canonized St. Joseph. Therefore, the largest cathedral in Hanoi was canonized as "St. Joseph Cathedral," opened at Christmas 1887, after two years of construction in the same architecture with the Notre Dame Cathedral in Paris, France. This is the place of the Catholic solemnities and the procession of St. Joseph of the Hanoi Diocese on March 19 each year. At Hanoi Cathedral, fun space along with shimmering lights and decorations for the Christmas holidays. A happy Christmas atmosphere prevailed over the capital with a range of bustling activities on Christmas Eve made it a sleepless night for thousands of people to celebrate the last days of 2017. As a centre of Catholic activities in Hanoi and surrounding areas, the Hanoi Cathedral remains a highlight of the Christmas holidays. Both its inside and outside were decorated earlier this month to bring in a colourful and happy Christmas atmosphere. This year, a giant Christmas tree was erected on the right side of the church. Praying in the church is indispensable for any Christian believer on Christmas Eve. 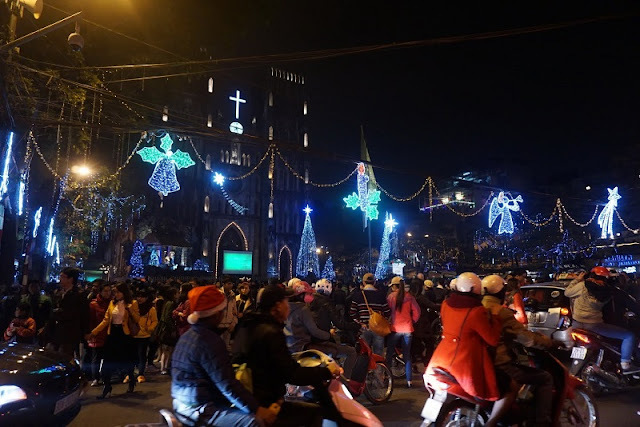 Luckily, there are a lot of churches around Hanoi in which people can enjoy a wide variety of religious activities as well as hymns singing and other music performance. Among the churches around Hanoi, Saint Joseph Cathedral located at 40 Nha Chung Street, Hoan Kiem, Hanoi should be the most magnificent and famous one. Besides, you can visit Ham Long Church at 21 Ham Long Street, Hoan Kiem or Cua Bac Church at 56 Phan Dinh Phung, Ba Dinh, Hanoi. Join us in the fun atmosphere of Christmas Eve at Hanoi Cathedral by contacting us to get the journey to explore Vietnam this Christmas.